If aircraft had feelings…. Alpha Bravo would be pissed off ! 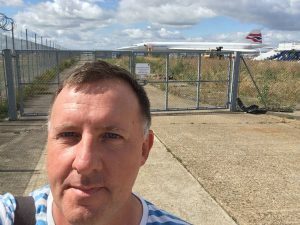 While other Concorde aircraft are preserved in specially designed hangars and have become tourist attractions Alpha Bravo the third Concorde to be delivered to British Airways is parked in a disused car park at Heathrow Airport only really visible to departing passengers on Runway 27L. Following the Paris Crash of F-BTSC in July 2000, Alpha Bravo made its final flight back to Heathrow from New York on August 15th just hours before the types Certificate of Airworthiness was temporarily withdrawn. Alpha Bravo was subsequently not modified along with the other British Airways in 2001 and never returned to service. Since 2000 then Alpha Bravo has skulked around Heathrow, plans to properly display the Aircraft at Terminal 5 (much like the Concorde at Paris CGG) never materialised. In 2004 British Airways donated the aircraft to BAA the owners of Heathrow Airport, but it seems that Heathrow have no interest in displaying the aircraft. Rumours of the aircraft’s poor condition and outlandish plans of moves to Dubai or a barge on the Thames or even return the aircraft to flight have come and gone over the past few years, while Alpha Bravo sits unloved in a car park. 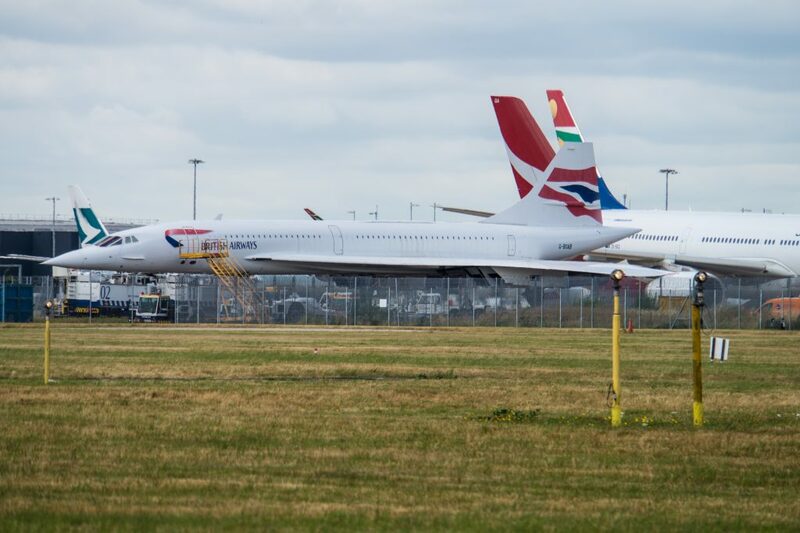 The current state of Alpha Bravo is in my view a disgrace which reflects poorly on both Heathrow Airport and British Airways, although to their credit they have recently carried out some minor maintenance to the airframe. Very sorry to read this. In July 1994 I took a subsonic flight on Alpha Bravo, Heathrow to Glasgow. It was one of David Gladwin’s operations. The only Concorde flight I had (or could afford!) AB developed a fault before take off when one of the three computers failed. Departure was delayed while special permission was sought (from BA? ), to continue, not easy to get on a Sunday.. During take off at the point of rotation a warning light appeared in the cockpit and an emergency stop was performed. As a result the brakes overheated and AB sat at the end of the runway for some time while the cooling fans did their job on the pads, discs (and tyres??). The flight to Glasgow then continued without a hitch (apparently) at 660mph. I sat at Glasgow airport waiting for my British Midland return flight, expecting to see AB take off on its scheduled 2 hour supersonic flight (also by David G) but it did not move because of the afore-mentioned computer problem. AB landed at Heathrow soon after my BM plane did. A memorable experience never to be repeated! The thrill of what was described as a “sporting take off” as there was no luggage on board. The thrill of hearing the co-pilot announce “100, 150, 200, 250 rotation” and that speed came up PDQ! Luckily cockpit visits were still allowed and there was a stream of passengers in and out. Not a lot of room though, and the plane was full! what a fantastic memory.. it was the “Sporting Take off” that i really remember as well in my case fully loaded turning over Jamaica Bay departing JFK – Thanks for the Post Mike ! Thanks Ed but I cannot let your comment about LHR’s “grasshoppers” (cue Cockney Rhyming slang!) go without a remark from me! I live 150 miles from LGW and LHR and in years gone by often took my children to both to “plane watch”, before viewing at both was stopped. I often wondered why and would it return? I wonder if the Herald is still up top at Gatwick, and the facilities at the Queens Building roof were great – saw Concorde several times from there n the 80s. Surely it was nothing to do with terrorism? Subsequently I made a habit of stopping briefly at a small parking place next to a sub-station by a dual carriageway off the eastern end of the runway. Often other cars were parked there or opposite. Last time was 5 years ago when returning from a visit to Portsmouth, my wife and I had our 5 yr old granddaugher Amy with us. We are an elderly couple having exceeded our three score years and ten. We watched the air activity for a while (which Amy loved) from outside before piling back in the car to continue our journey. About to pull out with indicator flashing when I heard a loud beeping noise from behind and what I can only describe as an old van containing two policemen who gesticulated that I should stop. Not knowing who they were, I often wonder what would have happened had I driven off at speed in my ancient Mondeo diesel! Two youthful coppers (I presumed them to be Transport Police) approached me in an aggressive manner, demanding to know who we were and what we were doing there (as if it was not obvious.) Amy was a bit alarmed as you can imagine. I was able to provide evidence of my identity and, knowing a bit about police procedures, I pointed out that my identity would tally with PNC. This was met with sarcasm. Why were we there? Plane watching did not seem to impress for some reason nor did it when I explained we do not see much air activity where we live in Suffolk. I enquired if parking was permitted at that spot. The reply was “if you park here, you will be checked!”. There was a dropped kerb, no yellow lines or restrictions and shortly before they arrived there had been others parked nearby. Eventually I was told I could leave. I refrained from asking “have you nothing better to do” as clearly they had not! We have not been back since. I would go again but my wife will not hear of it! This frightened the life out of her! Mike, thats horrible I’m afraid the real villains are Heathrow Airport who shut the Queens Building (also many happy childhood memories) and who really don’t like plane spotters – It’s very different in Amsterdam or Zurich Airports I know well who welcome visitors with dedicated facilities.. I don’t think it is understood that plane spotters contribute to general surveillance particularly as they can have a heightened sense of observation. After 911 I recall train spotters being removed London terminal stations because such activity was considered suspicious by our US cousins. On one occasion a young lad had his camera confiscated for taking pictures of trains. However, 100% of the blame for creating this suspicious environment must go towards those who have carried out murderous acts (or intent to). But I like so many enthusiasts including people who built her & travel the country as volunteers bringing these Marvels of the air back to life to prove that they were built so well that a full refurb will be very expensive, but I believe that it’s possible to make the parts again that Concorde needs to get her airworthy & although Alpha Bravo is an older Concorde it’s still possible to restore her to Flight Airworthyness as so many people would like to see her flying again like the Battle of Britain Memmorial Flight!!! Because Concorde Represents something more than the sum of her parts & all 2 billion pounds of her was paid for by the British& French Tax Payer & ultimately if British Airways or Air France won’t facilitate either Aircraft being restored for historical flight purposes then legal force should be bought about to compel them to release Concorde subject to strict CAA regulations, people are crying out to see Concorde again & I’m sure there’s lots of Companies out there who would fall over themselves to see there Logo on her & Flying!!! God Bless England & The Queen & God Save Concorde!!! Hello Jafffa, thanks so much for you comment. I fully agree with your sentiments but I fear we will never see Concorde flying again, the complexity of the aircraft and cost to bring it back into service would be just too much… especially in a country where aviation is not the national obsession it was for you and I. Alpha Bravo is I’m afraid a lost cause from an airworthiness point of view, I just wish she could be displayed in a location that reflects her historical significance. I have a birds-eye photo of Alpha Bravo from a video I took while departing Heathrow on a Virgin Atlantic flight to LA in December 2015. She looks so unloved surrounded by airport detritus. I flew on Alpha Charlie on 20th June 2003 from Heathrow to New York with my dad. It was a fantastic once-in-a-life-time experience for both of us. We visited her again exactly 10 years later (June 2013) at the Aviation Park in Manchester. At least G-BOAC has a permanent covered home. I have my name in the back of the pre-production aircraft G-BBDG at Brooklands (I donated some money towards her restoration). It wasn’t a big donation, so I was really surprised to see my name on display when I visited her. My dad is now 92. He worked in British aviation (jet engines, fixed-wing and helicopters) all of his career. He worked on pioneering aircraft such as the prototype de Havilland Vampire when Britain proudly lead the world. He also performed flight tests on Lancaster Bombers after the end of WWII, which were used to test early jet engines. In the 1950s, he accompanied jet aircraft performing the very first carrier landing tests on the HMS Albion (R07) and worked on flight tests at Boscombe Down. He also worked on the original Comet airliner and the Buccaneer. It makes him very sad to see the sorry state of the British aircraft industry today. Even Filton hasn’t survived as an operational airfield. American’s celebrate their own aviation heritage (and ours) far more than we do. thanks for your comments james I feel very much the same. Was really supriced when I was onboard taxiing toward runway 27L. 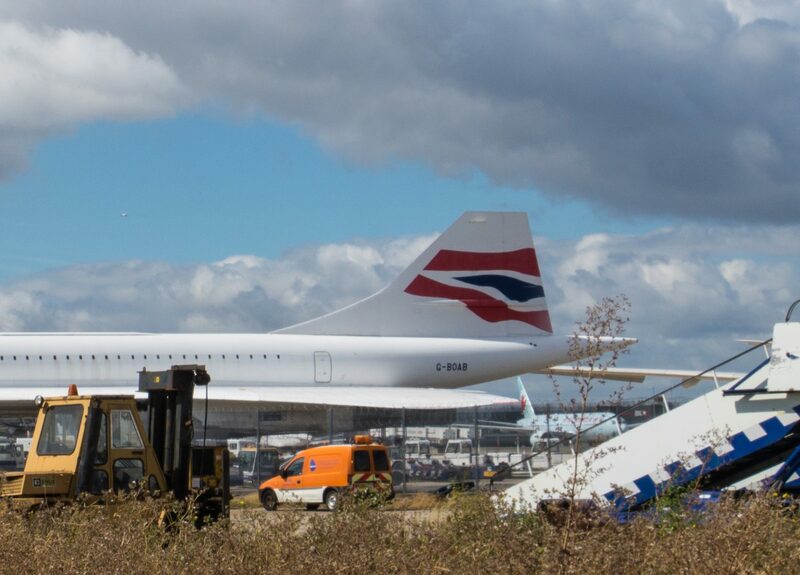 Seeing the concorde sitting outside forgotten like that is really a shame. Got a few pictures thru my aircraft window of the concorde and a BA A380 lining up to takeoff in the same frame. I so regrett not taking the special offer to fly concorde oneway NYC for airline staff. This when I worked at Scandinavian Airlines. Some of these comments bring back fond memories of Heathrow & plane spotting. In my younger days you could actually step across the perimeter ‘fence’, (single bar wooden type) and walk onto the runway. After school, I used to meet up with like-minded souls and just walk into the Pan Am maintenance area, South side, and use the staff canteen for a meal. No security problems at all. Getting back to Concorde, I worked on telemetry modules for the pre-production type whilst an apprentice at one of the many sub-contractor firms and in1992-94 I found myself back with Concorde, working for BA security. I have been in every Concorde numerous times, unfortunately never flown! I met so many famous people while guarding the aircraft, searching passenger bags and in the Concorde lounge. However, the one thing that sticks in my mind is on 25th October 1993 at about 18:00 hours, when I received a call to go to a sector at the Western end of the South runway, where I came across Concorde Alpha Bravo, with fuel pouring out of the port wing. The fire brigade had foamed the entire underside of the aircraft, all the pax were off BUT all of their personal belongings were still in the overheads and in their seat pockets. There was a police officer at the catering door (starboard side front), which is how the pax disembarked and an engineer in the cockpit. I was joined by other security members and our task was to systematically ‘search’ the aircraft for all personal belongings. You may think this was easy, but two things made it very hazardous. On the ground, Concorde can become tail heavy if it isn’t loaded/unloaded correctly, and can tip up! With fuel pouring uncontrolled out of the wing tank, the C of G can change rapidly and with us walking through the cabin, this would add to the problem. The engineer was frantically pumping fuel around various tanks and to a bowser to take fuel off. He gave us his commands to follow if the need arose. They were ‘Stop’, meaning stand exactly where you are; ‘Run to front’, to shift the weight back to the front and ‘Evacuate’ meaning get off by any means. Obviously if the aircraft tipped there was a good chance of a fire. This whole event was caused by a seized brake causing a tyre to burst and breaking the rain deflector, parts of which hit the underside of the wing and ruptured the tank. I don’t think the pax knew how lucky they were that this happened whilst taxiing to the runway and not at ‘Rotate’. This came so very close to being a Paris accident, particularly as it was about to go out over London. What is really annoying is the fact that wing tanks had been ruptured 6 times before the Paris crash, and that was therefore wholly preventable. Someone individually and/or corporate should have been prosecuted for negligence. Once I had completed the Concorde search and repatriated the pax with their belongings, I spent 3 hours in the BA Tel Aviv lounge searching pax and bags whilst reeking of aviation fuel until 23:30 hours. Fond memories! Hi Chris, it may be worth contacting Heathrow/Birmingham Airport as they are almost certainly going to have that information logged somewhere.